Whether a veteran of backcountry adventure or a first timer, preparation is the key to a successful hut trip. 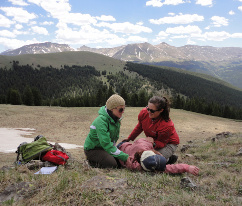 The 10th Mountain Division Hut Association has partnered with the University of Colorado School of Medicine's Wilderness & Environmental Medicine program to offer a tailor-made course in backcountry first aid, specific to the high altitude winter environment of Colorado. This 16-hour course will be offered in the pre-season just as the first snows fall and will take place in Boulder and Vail. The course is equivalent to a Wilderness First Aid Course, but is contextualized for 10th Mountain Hut travel and extreme winter adventure, including topics of avalanche safety, high altitude, hypothermia, frostbite, immersion, snow travel, trauma, musculoskeletal soft tissue issues, dislocations/fractures, navigation, and lost persons. Expert faculty from the CU School of Medicine will teach through a combination of lectures and hands-on practical skills, and participants will receive a certificate from the School of Medicine attesting to a WFA in the 10th Mountain Medicine Course. Learn to do this safely! Focus on identifying the right questions, rather than on providing "answers". All courses begin Thursday night in Leadville with a lecture, followed by a Friday morning lecture. We will then travel into the backcountry for two nights at the Sangree M. Froelicher hut. All participants should be comfortable on backcountry touring gear, either touring skis with skins, splitboard with skins or snowshoes. 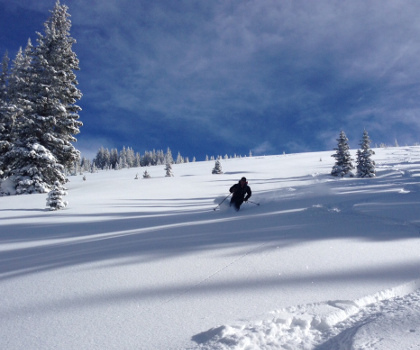 Avalanche courses are offered through Aspen Alpine Guides and hosted by 10th Mountain Division Hut Association. Classes are limited in size and fill quickly. To register, contact Aspen Alpine Guides via email or at 970-925-6618. The Grand Huts Association, in conjucntion with the Colorado Mountain School, is offering AIARE Level 1 avalanche courses this winter at the Broome Hut. You’ll spend three days and two nights exploring backcountry terrain on skis, splitboard, or snowshoes with dedicated AIARE instructors. Whether you’re new to the backcountry or an experienced veteran, Berthoud Pass has fun and exciting terrain that will provide a fun atmosphere for learning firsthand. In addition to the avalanche workshops listed above, avalanche education is available through private guide services, community colleges, and other groups. Some courses are mulit-day events, often based out of a hut, while other programs are classroom based or involve a day field trip. The Colorado Avalanche Information Center offers a thorough list of avalanche education providers on the education page of the CAIC website. The 10th Mountain Division Hut Association and Paragon Guides are offering the 2020 Interconnect Ski Tour from January 20th to 24th. Spend four days ski-touring from hut to hut in the remote Colorado backcountry all while staying in rustic 10th Mountain Division huts that will provide a great, warm, night’s sleep. 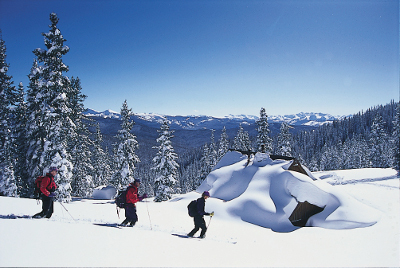 Over the course of three nights and four days you will experience the beautiful Colorado backcountry during a guided ski-tour stretching between Eagle and Aspen, Colorado. Eat delicious hut-cooked food and enjoy the special sort of camaraderie only found in the mountains. In the Fall each year we try and do informational presentations on the hut system and hut trips at REI's along the Front Range and in Silverthorne. The talks are a great opportunity for people to get acquainted with the hut system and hut trips. Whether you are a regular hut user, or have always wanted to know more about the best hut system in North America this presentation could help send you on your way to one of the 35 huts waiting for you high in the Colorado Rockies. Our expert staff will be on hand to answer all of your questions whether you want to know about winter or summer travel to the huts.